The Relentless Reader: Dun Dun Dun! Under the Dome! Dun Dun Dun! Under the Dome! Peer pressure strikes again folks! 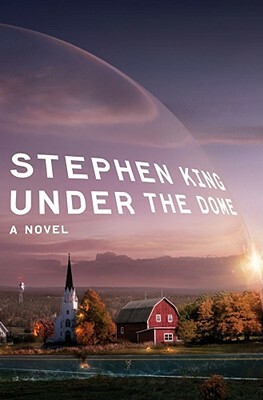 This time I've been coerced into reading Under The Dome by Stephen King. Alright, I'll be honest. I saw some folks chatting about this on Twitter and I didn't want to be left out. You can find all the sweet details here. I've never participated in a readalong of a chunkster book. (Have I joined in any readalongs? I don't think so.) To be frank, I don't know how this will work for me. I read lickity-split fast and I've never read more than one book at a time. THIS WILL FEEL ALL WEIRD! So, yea, first world problem for sure. Want to spend the summer with me Jen? I sure do Uncle Stevie! It's been a long time since I've read King (not counting Rage, the novella I read in February) This should be a fun ride! On an entirely normal, beautiful fall day in Chester's Mill, Maine, the town is inexplicably and suddenly sealed off from the rest of the world by an invisible force field. Planes crash into it and fall from the sky in flaming wreckage, a gardener's hand is severed as "the dome" comes down on it, people running errands in the neighboring town are divided from their families, and cars explode on impact. No one can fathom what this barrier is, where it came from, and when -- or if -- it will go away. Dale Barbara, Iraq vet and now a short-order cook, finds himself teamed with a few intrepid citizens -- town newspaper owner Julia Shumway, a physician's assistant at the hospital, a select-woman, and three brave kids. Against them stands Big Jim Rennie, a politician who will stop at nothing -- even murder -- to hold the reins of power, and his son, who is keeping a horrible secret in a dark pantry. But their main adversary is the Dome itself. Because time isn't just short. It's running out. It has been FOREVER since I read any King, too! This premise intrigues me, possibly because of the Simpsons movie. If I can get it through my library in time maybe I'll join, too! Oh my word, that's right! I'd forgotten about the Simpsons movie, ha! I hope you do join in Kristin, I think it's going to be a hoot! Fantastic! I hope you are participating Celine! Read-a-longs are so much fun, but I can see the pacing being a problemo. You're wicked fast! I haven't read any King in forever, either! This one sounds really good. Are you thinking about joining in Monika? I hope so! I so wish I could do this, but I don't think it would work well since I'm already failing at Strange & Norrell. 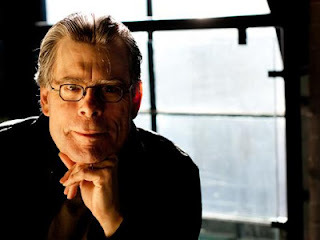 The first King I read was 11/22/63, but I totally loved that and I'm REALLY interested in this one...so I'll be curious to see what you think! Oh yes, you're already in the middle of a chunkster aren't you? ;) I haven't gotten around to 11/22/63 yet. One day! This is going to be fun! I haven't read King in more than 20 years and I'm looking forward to being reminded of why I used to read him voraciously. I gobbled up everything of his that I could when I was young but it's been a LONG time since I've read anything of his. I'm super excited! I am totally not up for re-reading this thing (I didn't care for it, wanted to throw it across the room when I finished), but I'm interested to see what other people think. Ha ha! I'm picturing that now ;) One of the things I dig about you is how passionate you are about books. Whether you love or hate them! Without getting into spoiler territory, I will say that I was actually pretty into it until the end...and it might have only been because I'm super familiar with pretty much everything he's written, so I felt like he'd done it before, but better. I've noticed that other people (mostly those who haven't read and re-read his work) liked this and 11/22/63 a lot more than the Constant Readers. I'm going to live vicariously through you for this one! Looking forward to the sequel to The Shining coming out in September, but so far haven't been tempted by this behemoth! May the force be with you. Thanks Chris, I may need that force ;) That reminds me that I'd like to re-read The Shining one of these days too! Doing a readalong is a different sort of beast. When I was doing two earlier this year, Telegraph Avenue and Possession, I found that it worked best for me to set aside a chunk of time,usually a Saturday or Sunday morning, to just read through the "assignment" for that week. Then I put the book aside for a week and read other things before I came back to it. That's maybe not the most efficient way to do it, but it helped me focus on read sort of "at pace" and still get some other books read. I'm not sure how I'll do the #domealong exactly, but I'm excited! So excited that you'll be joining! Welcome, welcome! Chunkster books for a readalong seem to work fine for me if the other books I'm reading are not as intense. For example, I'll read the chunkster, then have a smaller book to read, and then I always have an audio going so that's been my normal recipe for reading success. I'm a big King fan now and love his work, so I'm looking forward to everyone's thoughts as we read through this together. And if you read fast, go for it!! Just write up your thoughts right away so you don't forget and then publish it on the final date so no spoilers get revealed. This will be such a blast with everyone and I can't wait to dive in with everyone! Good idea to write up posts in advance, I'll probably do just that. I'm super excited to have joined this readalong, woot! Sounds good, but whoa, chunkster. That said, the fact everyone else is reading it too could help. I just finished it last week! I rented the audio cd from the library and took turns reading it at home and listening to it on my commute. It was great! Ohh Jennifer, I also want to participate! Thanks for the information, I will check it in the host blog! Oh good!! It's not too late! I'm so glad you'll be joining in!